Photo: Johnny Fägersten, Jessica Mitrosbaras, and Robert Åberg. 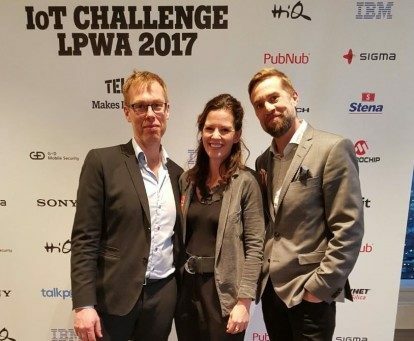 Tele2 IoT Challenge: LPWA started in January and united 135 participants from 28 countries. The theme and main point of the experiment in the competition was a new LPWA (Low Power Wide Area) IoT network based on LoRa technology. The IoT network was launched by Tele2 IoT in collaboration with Talkpool AB and covers the Greater Gothenburg area. The network provides multiple advantages from energy saving for IoT linked devices to new opportunities arising due to attractive hardware pricing. The participants had a chance to experiment with the new technology and stretch their imagination. At the grand finale on March 29, 2017, the organizers announced and awarded the authors of the winnings solutions. The solution ranked first, GuardPuck, prevents diesel theft from work vehicles and is an excellent example of the benefits that IoT can bring. This and other solutions presented at the competition push the boundaries of the conventional reality and fuel innovations. Sigma Technology Solutions support inventive enthusiasm and believe in the force of IoT innovations. “We were happy to be a partner of Tele2 IoT Challenge. This competition presents glimpses of the future and paves the way for the full-scale application of new technologies. Sigma has been building competence in software development for 30 years. Several years ago, we used our competence as a base to build IoT expertise. Since then, we have been moving seven-league strides. We hope that IoT enthusiasts we saw at the competition will succeed in their initiatives and one day will be our peers in the advancement of IoT,” says Robert Åberg, Head of IoT Solutions at Sigma Technology Solutions.